Scene: Morning comes, time for hubby to wake up. It’s 6 a.m. and dark. What is there to get up for? I have ten hours of aloneness stretching in front of me. And I can’t even stand to write for more than five. At 7 a.m., or 7:30, or 8, or 8:30, the day is brighter, and I can finally stand to face it. So I hoist myself out of bed, trying to brush away the cobwebs in my brain. I debate how to start the day. I will pray. I always pray. But maybe I will try to exercise first, because I’m still not thinking too clearly. Maybe exercise will clear out some of the cobwebs. There’s no way I can do another set of these squats. Fast forward through a shower and breakfast. Now it’s 9:30 or 10. I sit down at my dining room table-slash-workspace, and try to pray. “Lord, I’ll just be honest. I don’t wanna face this day. I know you are big and great and all powerful. I know that you offer me “glorious, unlimited resources” [says the New Living Translation of Ephesians]. I just don’t feel them right now. I feel depressed, and I think I shouldn’t, because you have been so good to me this past year. And I am so thankful I’m able to write instead of teach bratty high school kids this year (oh, am I thankful!). And I don’t know why, if I’m so blessed, I’m having these feelings. Asking God actual questions that I expect Him to answer is a new thing for me. It’s all due to Paul Coneff and Straight 2 the Heart, or the prayer ministry I have been working with since last July, both learning to pray for myself and with others, and helping to write The Hidden Half of the Gospel with Paul. I mean lost in my career at the moment. I recognize this feeling from January, right after I finished my master’s degree and before starting this blog. Around that time, I applied to an MFA and a PhD program, and currently [in March] I am still waiting to hear from both. I canceled my birth control in January, too, and am still waiting to see if we’re fertile. I’m almost done helping Paul with his book, and am now waiting to see if he wants to really make me part of his ministry (which I love), or if I’m just to be on call when he has a writing project. I also have this “Before Thirty Project”—my memoir—roughly handwritten in about three notebooks, but the task of polishing and marketing it seems too huge when my life could take a drastic turn any day. And then I have this blog, which I can easily pour all my time into, but I don’t feel that would be very wise. Notice my mind—see how it races! It does this a lot. I get to thinking about things so frenetically that I can hardly choose one single activity to start my “work” day. Like on a day like today. Since learning to pray dialogically (yep, that’s another grad school word [meaning two-way]), usually I do hear from God. Usually the answers materialize almost as soon as I formulate the question, or I get an impression. 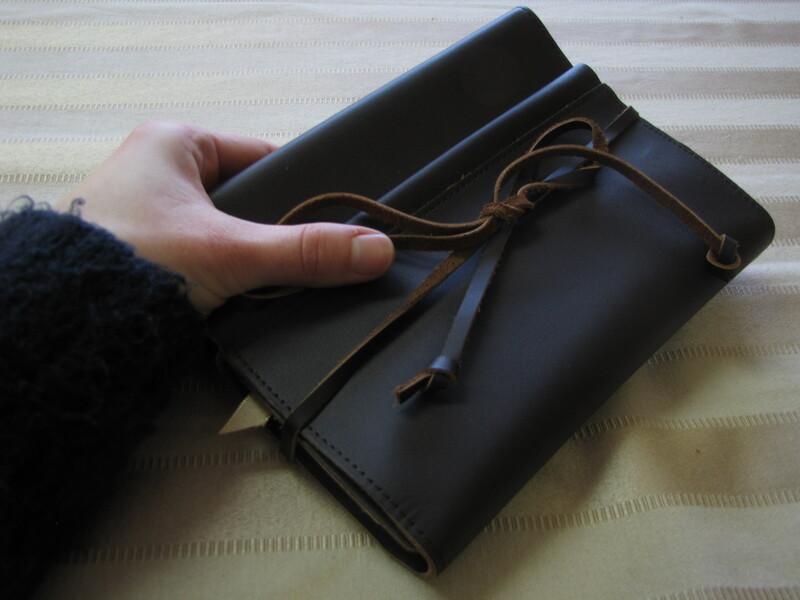 Now, I don’t hear words, but I feel my eyes gliding to rest on my prayer journal. It occurs to me (and let’s not discount Who is making it occur) that I have been trying so hard to make something happen today, to reinvent the wheel, to even figure out what to pray for—and I’m probably repeating myself. I’ve forgotten something. Maybe all I need to do is look again at what God’s already told me. 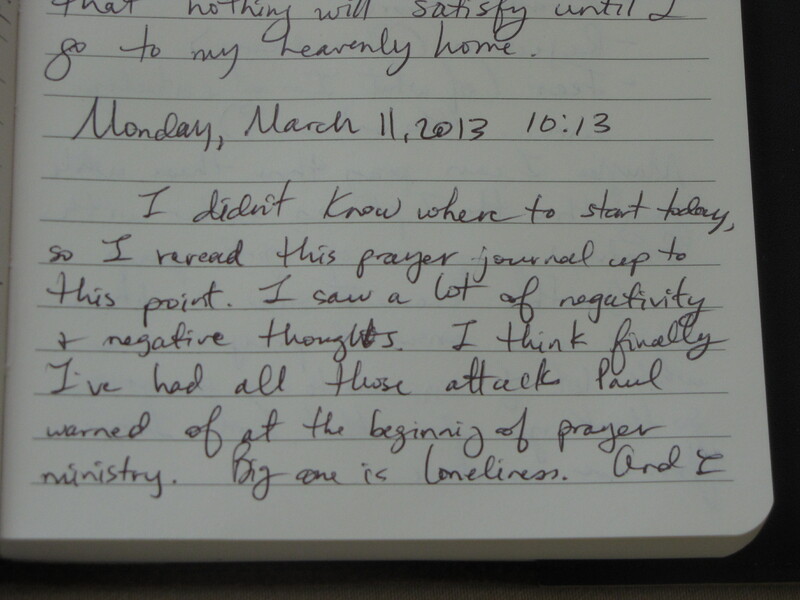 (This is the benefit of keeping a prayer journal). So I open it up and read what I’ve written for the past three months. Loneliness, the sense of loneliness from being alone in this big house all day. Resentment that I was doing so much for others and yet feeling so little being done for me. My blog readers have a better idea of my feelings than most of my friends, because I hide them (my feelings, I mean). As I reread these woes, I feel discouraged at first. Gosh darn, and I thought I’d done so much growing over the past year with Straight 2 the Heart! But as I read, I also see another pattern emerging. For each whiny problem, God’s booming voice answers. I’m alone, angry, overwhelmed, and resentful, but through it all, represented in my messy scrawl, is God’s much bigger voice—His promises, His care. 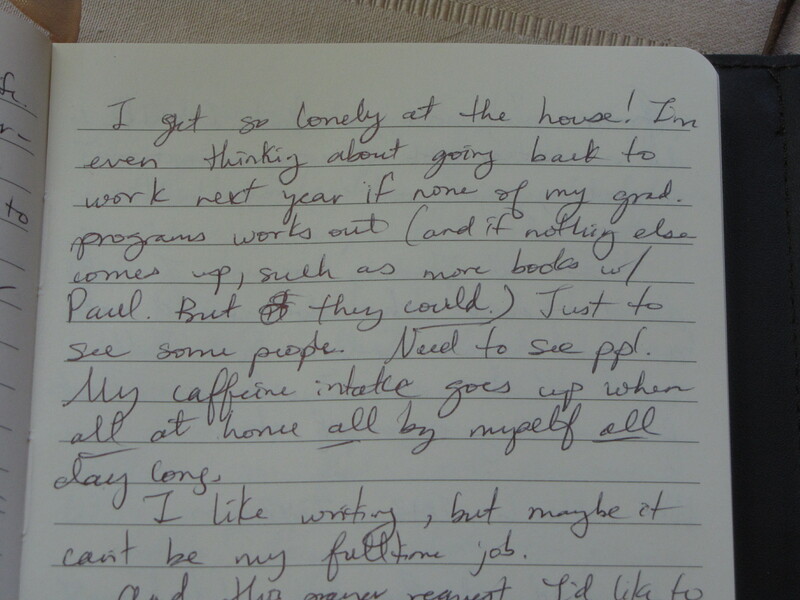 And to that end, I see something else in these journal entries. For my stress in ministry, God has brought more people to help, such as a new friend at church who has taken the choir idea and run with it. He has also taken away the burden of our Bible study by moving it to a young adult class at our church, which our church desperately needed! For my loneliness, God has added some people to my life, like a niece who comes over sometimes to get tutoring during the week; a Groupon-shopping friend who invites me for spa days periodically; and this blog, where I am meeting more like-minded people all the time. 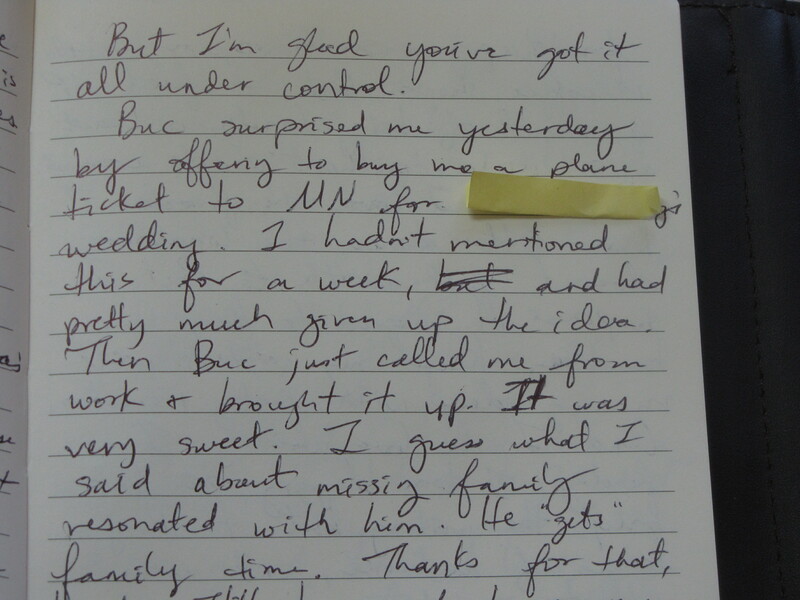 For my loss of family time, God moved my hubby just a week ago to decide (on his own) to buy me a plane ticket so I can take part in a cousin’s wedding in Minnesota next week. Oh, thank you, Lord—how I have missed family! As I look at all these blessings, I am again overwhelmed, but now in a good way. Huh. Actually, for the first few months of prayer ministry, I felt great. Wondered where Satan was. Thought I was getting off easy when all my group mates reported greater attacks from the enemy. Oh, but he is a master deceiver. And maybe he was just waiting…waiting…to throw me off his trail. So that I wouldn’t recognize his attacks for what they were when they finally came. Well, they’ve arrived. And each morning this week I’ve had to fend them off on my knees. And I’m still not hearing God like I want to. But I also remember that lots of God’s people went through wilderness experiences. And it didn’t mean God wasn’t there (remember the poem “Footprints”?). I know he’s here. Though it may take me a little extra time to get out of bed these days, I won’t give up praying. I will hold on—knowing God and I will ride out this storm together—knowing this abyss is just one of Satan’s many illusions—and it, too, shall pass. This week I will also remember that God has a plan, and that I don’t have to have all the particulars right now. When I look back in a few months or years, hindsight will be clear enough. R u coming next week? Is that what this means? Yeah! That’s what it means, Cheri! I am floored! It’s been too long, but I’m looking forward to it!